My family doesn’t like to get up early to eat breakfast. They’re more “eat as they walk out the door”. Which is great if I want to feed them packaged “breakfasts” that are packed with sugar that will just leave them wanting and crashing later in the day. 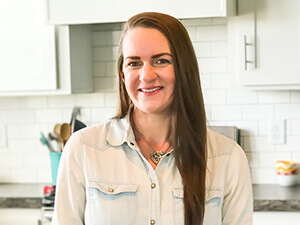 High protein is what I like to feed my family in the mornings to help them get their brains working without the crash of a high sugar breakfast. But who has time to fry or scramble eggs, fry bacon, and heat water for coffee or tea every single weekday morning? I certainly don’t and I’ll bet you don’t either. That’s why when I find kitchen tools that can make my life easier I squeal with delight. No literally, I squealed when I received this box of goodies from OXO. So here are the tools I’m working with. 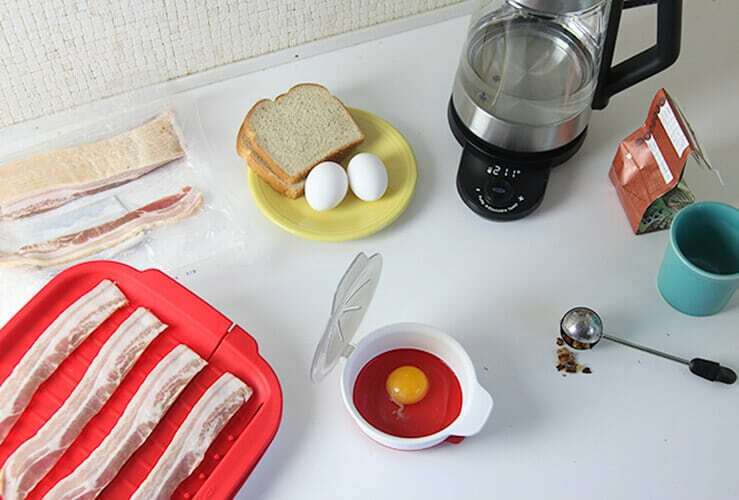 The Microwave Egg Cooker. I’ve used this thing so many times since I’ve gotten it and I LOVE it!! 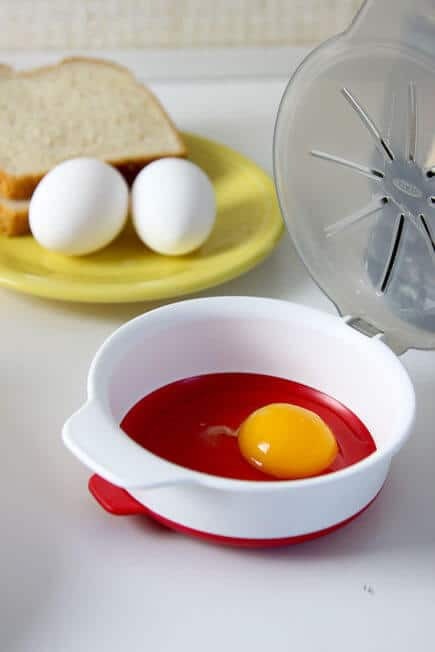 You can quickly fry or scramble eggs in the microwave…and it really works!! The Microwave Bacon Crisper. I have seen microwave bacon crispers before and let me just say, they do not work, and I’ll be honest, I was very skeptical that this one would be any different. It works. Now, the bacon is different than if you fry it on the stove, but it does work and the bacon is edible. 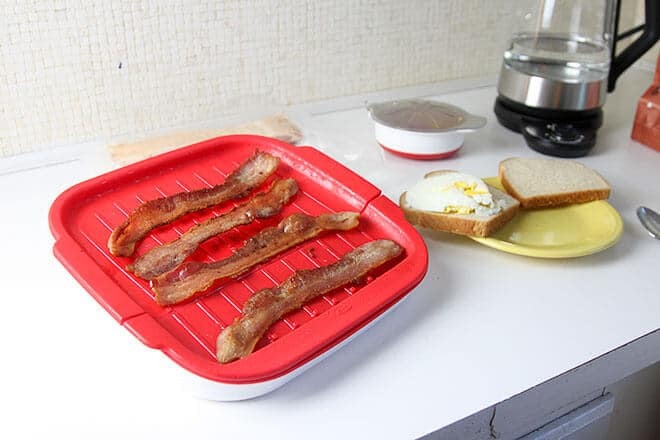 Unlike other microwave bacon cookers. The Adjustable Temperature Kettle. 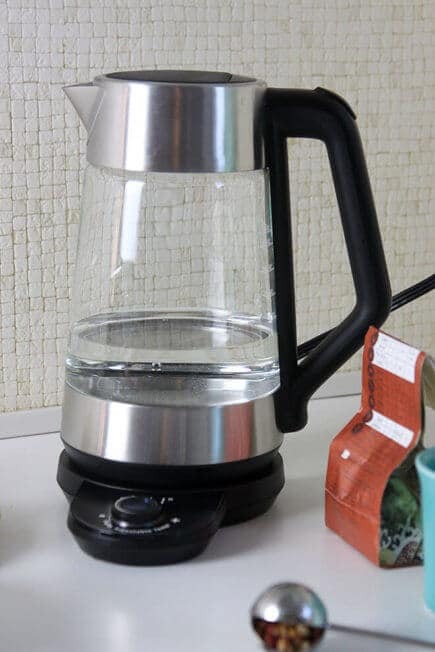 This kettle is awesome because you can set the exact temperature for what you want, whether it’s coffee, your tea of choice (many types of tea need different temperatures), or even hot cocoa. The kettle is cordless when removed from the base and has a silicone base so you don’t have to worry about burning your surfaces in the kitchen. The Twisting Tea Ball. No one wants floating tea leaves in their tea, at least I certainly don’t. 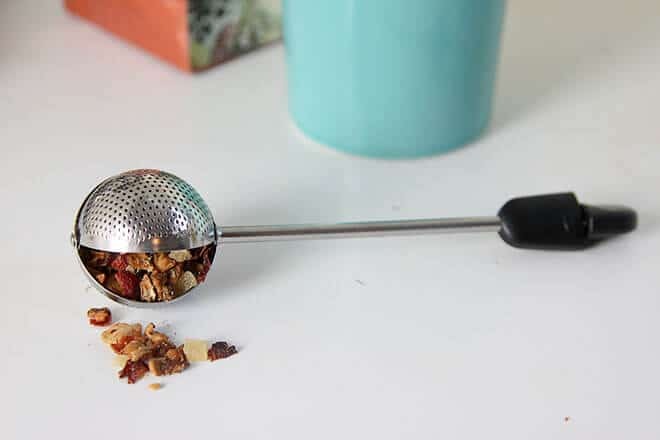 This tea ball is wide so that you can get the proper amount of tea leaves for your morning cup of tea, and twists closed to ensure the leaves stay in the ball. 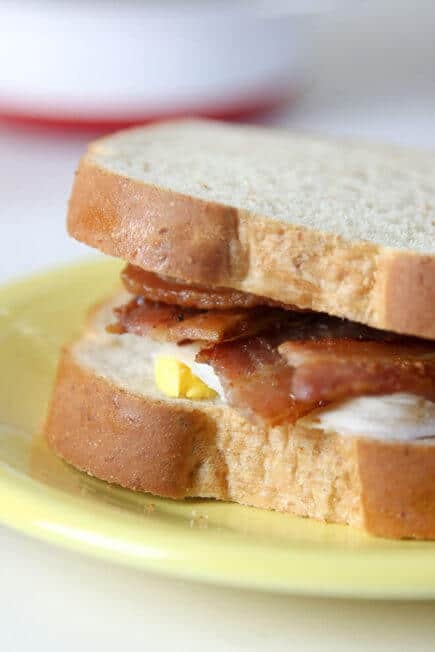 These tools allow me to make my family a delicious, healthy, protein filled breakfast (like this bacon & fried egg sandwich) in less time than it takes them to get ready for the day. This means that there is no sugar slump after a few hours of work or school. Which of these tools would you use?